Entry is £50 for the invited player. 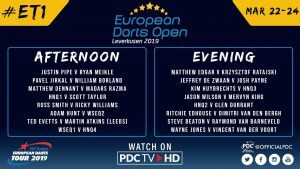 The chance to see 3x BDO World Champion and new PDC player Glen Durrant up close against the likes of PDC World Number 35, Chris Dobey. 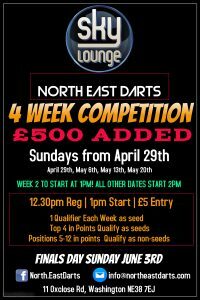 PDC & BDO players Ryan Joyce, Adam Hunt, Dave Prins, Terry Temple, Allan Edwards and Martin Atkins have also been invited. More players to be revealed soon! 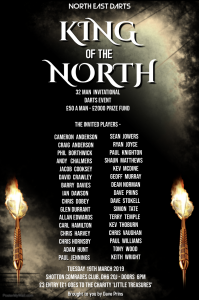 32 players battling it out for a chunk of the £2,000 Prize Fund on offer and the title of……’KING OF THE NORTH. 4 Floor Boards for Spectators to see all the action on the night. Stage Setup for Semi Finals and Final Matches. The format will be an F.A Cup Draw throughout with the early rounds best of 9, best of 11 for semis and best of 13 for the final. Who will be crowned KING OF THE NORTH? A 32 Man Invitational Event is coming to Peterlee & Horden Rugby Club this March. An idea put together by Dave Prins will consist of 32 players from the North competing to be ‘King of the North’. Keep an eye out on the site and Facebook for more information regarding tickets. 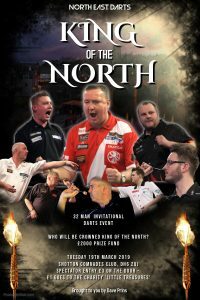 Rare chance to see 3x BDO World Champion Glen Durrant up close and personal taking on the likes of Chris Dobey, Ryan Joyce and Adam Hunt, all competing for a large sum of money and the title of the best player in the North. Thank You to James Mcclurg of McClurg scaffolding ltd for the continued support into 2019. McClurg Scaffolding have sponsored the NorthEastDarts website from 2017 along with competition sponsorship. I look forward to working with James on more big events in the future! Results, Averages and Latest Table after Week 2 now online HERE. 1/4’s Mick Armstrong, Alan Robertson, Bob Smith, Drew Mole. Week 2 Qualifier – TONY WOOD. Week 3 this Sunday – May 13th. Updated points list can be found HERE. 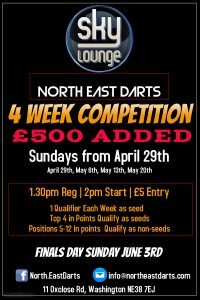 Competitions this Bank Holiday weekend.